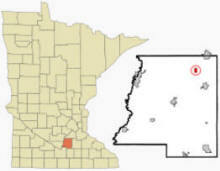 Heidelberg is a city in Le Sueur County, Minnesota. County Highway 28 serves as a main route in the community. 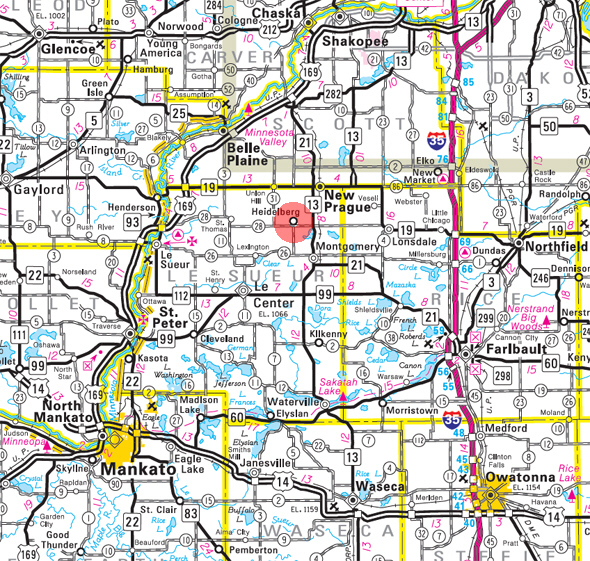 Minnesota State Highway 13 is nearby. According to the United States Census Bureau, the city has a total area of 0.53 square miles (1.37 km2), all of it land. 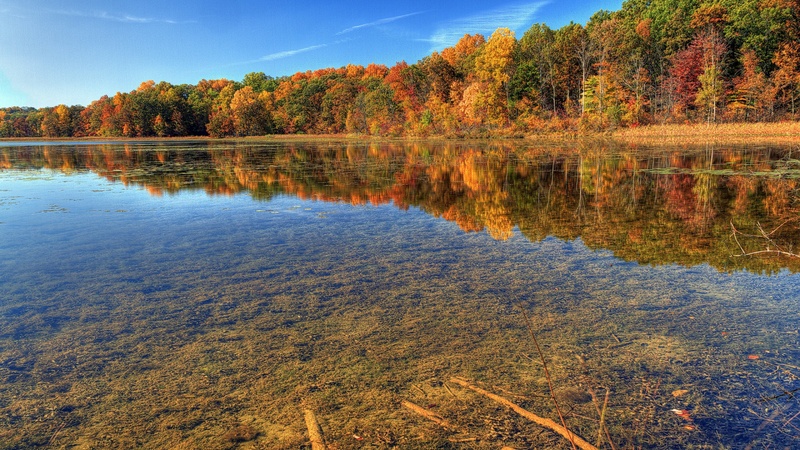 The elevation is 1,053 ft (321 m) above sea level. As of the census of 2010, there were 122 people, 41 households, and 34 families residing in the city. The population density was 230.2 inhabitants per square mile (88.9/km2). There were 47 housing units at an average density of 88.7 per square mile (34.2/km2). The racial makeup of the city was 100.0% White. Hispanic or Latino of any race were 1.6% of the population. There were 41 households of which 51.2% had children under the age of 18 living with them, 75.6% were married couples living together, 4.9% had a female householder with no husband present, 2.4% had a male householder with no wife present, and 17.1% were non-families. 12.2% of all households were made up of individuals and 4.9% had someone living alone who was 65 years of age or older. The average household size was 2.98 and the average family size was 3.32. The median age in the city was 40.3 years. 33.6% of residents were under the age of 18; 2.4% were between the ages of 18 and 24; 27.9% were from 25 to 44; 25.4% were from 45 to 64; and 10.7% were 65 years of age or older. The gender makeup of the city was 55.7% male and 44.3% female. 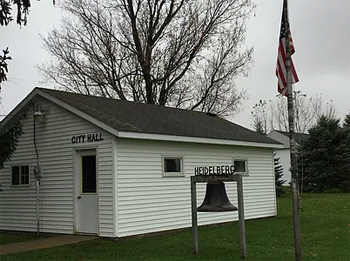 HEIDELBERG, a city in sections 19 and 20 of Lanesburg Township, was platted December 4, 1878, and was named by its German settlers for the city of Heidelberg in Germany, widely known for its great university, which was founded in 1386. It was incorporated as a village on June 26, 1894, and had a post office, 1872-1903. Odenthal Drywall is a family owned company whose construction knowledge, quality performance, service and teamwork enable us to provide an outstanding finished product on even the most demanding project. 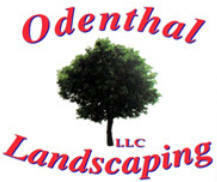 Odenthal Landscaping, LLC is a full service Landscaping Installation Contractor located in New Prague, Minnesota. With more than 20 years of experience we offer a full array of services for any size project. From small flagstone walkways to large complex retaining structures, we are your one stop shop for all of your landscaping installation needs. Contact Us today for your Free Estimate! 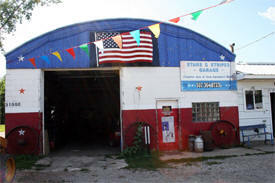 Quality Processing and Homemade Sausage Specializing in Quality Smoked Products. We are your "Everyday Entertaining Headquarters". 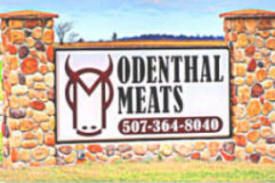 Your menu selections for everyday, as well as, holidays are made easier with the help of the unlimited choices at Odenthal Meats.